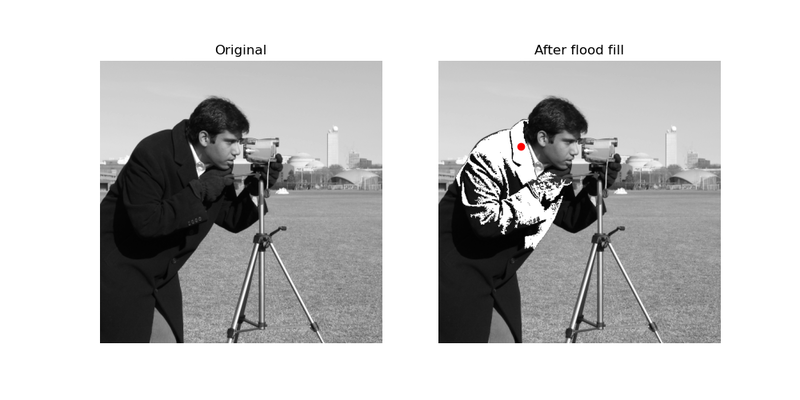 Flood fill is an algorithm to identify and/or change adjacent values in an image based on their similarity to an initial seed point . The conceptual analogy is the ‘paint bucket’ tool in many graphic editors. First, a basic example where we will change a checkerboard square from white to mid-gray. Because standard flood filling requires the neighbors to be strictly equal, its use is limited on real-world images with color gradients and noise. The tolerance keyword argument widens the permitted range about the initial value, allowing use on real-world images. Here we will experiment a bit on the cameraman. First, turning his coat from dark to light. Because the cameraman is dark haired it also changed his hair, as well as parts of the tripod. 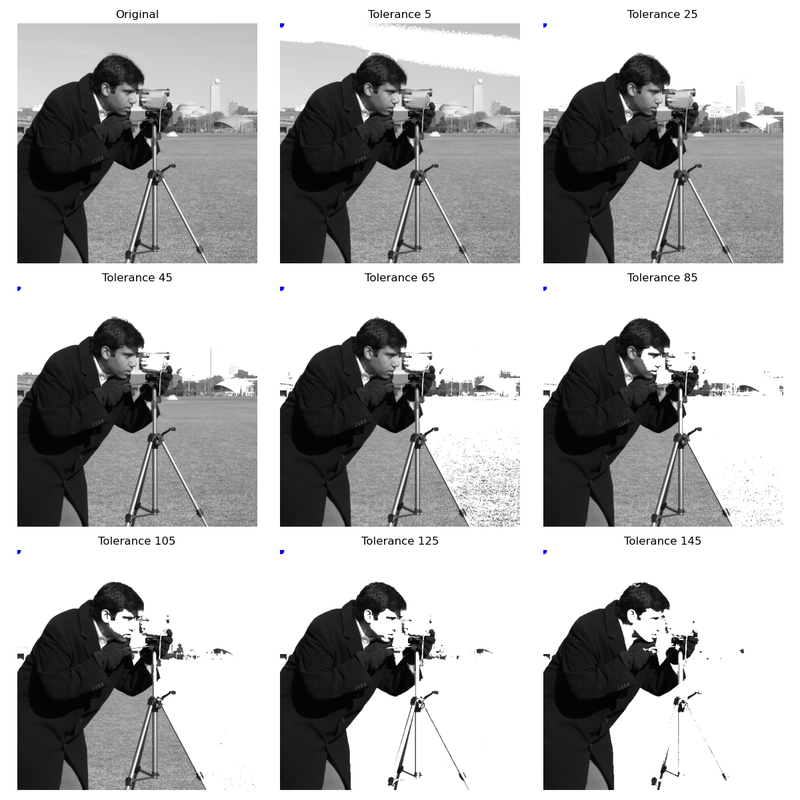 To get a better intuitive understanding of how the tolerance parameter works, here is a set of images progressively increasing the parameter with seed point in the upper left corner. # Plot all eight different tolerances for comparison. 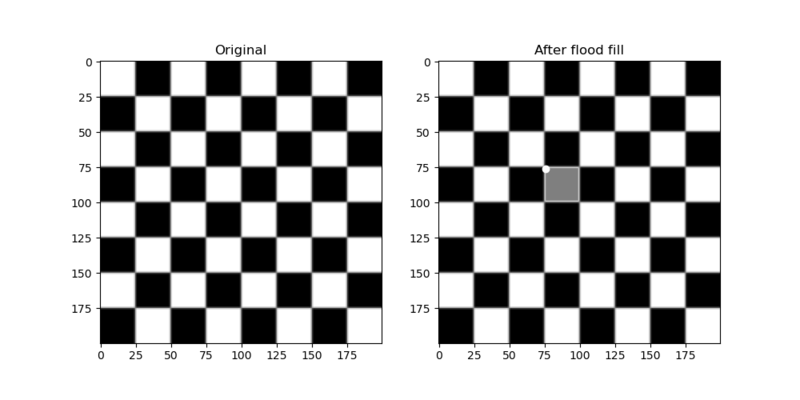 A sister function, flood , is available which returns a mask identifying the flood rather than modifying the image itself. 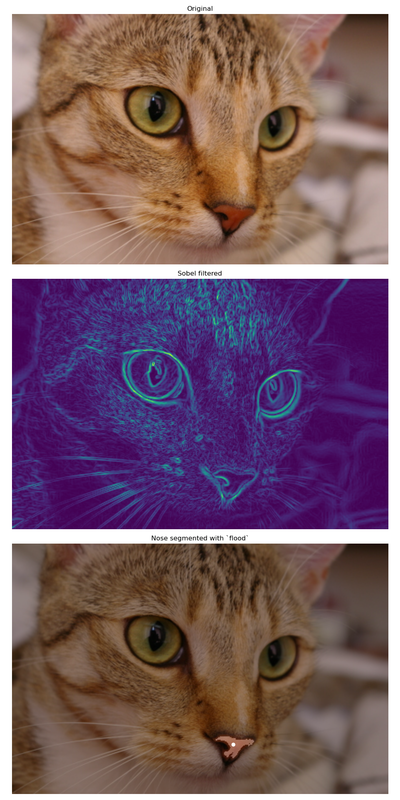 This is useful for segmentation purposes and more advanced analysis pipelines. Here we segment the nose of a cat. However, multi-channel images are not supported by flood[_fill]. Instead we Sobel filter the red channel to enhance edges, then flood the nose with a tolerance.